This gentle daily use conditioner harnesses the power of plants to moisturise, soften and smooth your unruly hair, minimising frizz, flyways, kinks and waves. Aveda Smooth Infusion Conditioner protects the surface of your hair for ultra shiny locks. While excessive heat styling and external aggressors can cause even the sleekest style to frizz up, this extremely lightweight formula from Aveda protects your hair to significantly reduce frizz and unwelcome kinks or waves. The exclusive plant extracts found in Smooth Infusion Conditioner contain a blend of organic aloe vera, maize and guar bean to create a smooth new surface on your hair, and tamanu oil, Australian sandalwood and Bulgarian rose to intensively moisturise and soothe, resulting in silky, shiny hair. 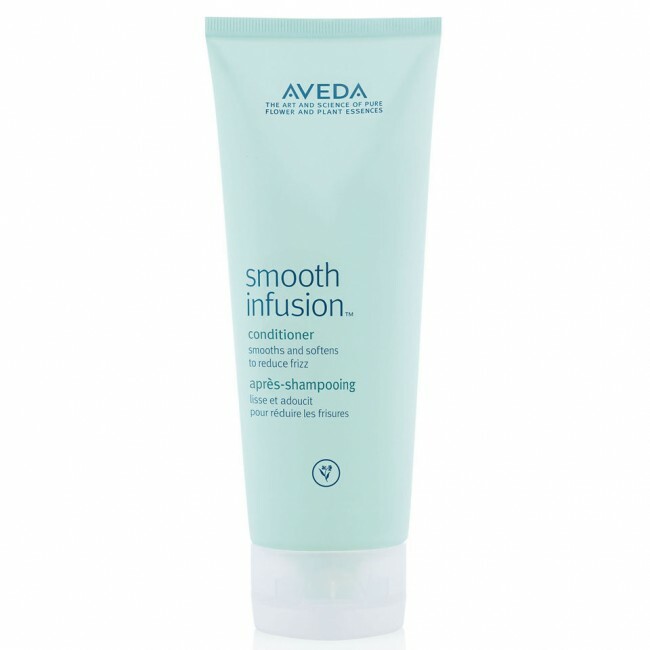 Cleanse your hair with Smooth Infusion Shampoo. Massage Smooth Infusion Conditioner into your hair.